Seashore Engineering was commissioned by the City of Bunbury, with the support of Bunbury Port Authority and the Department of Transport, to investigate erosion occurring at Koombana Beach, Bunbury and determine an appropriate coastal management strategy that achieves optimal outcomes for both the short and long term. Groynes with renourishment and a revetment along the Bunbury Port Lease Area. 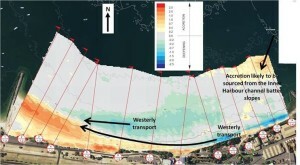 Detailed evaluation consisted of a design of appropriate layout and cross-sections, capital and maintenance cost estimates, recommended beach monitoring and identification of potential adaptation pathways. The renourishment strategy was concluded to provide low initial cost, a greater degree of flexibility and lower impacts to amenity and access along Koombana Beach and its implementation was subsequently recommended.